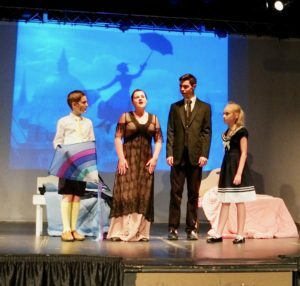 Last month, the YWCA’s Youth Theater program performed its premiere production of Mary Poppins, Jr. at Trinity-On-Main in New Britain. Two performances were held on June 29 and June 30 and the show sold nearly over 350 tickets. There were 24 youth ages 10-15 in the cast who auditioned earlier in the year. “I think our first performance was a huge success. We are so proud of all of the kids. This show was put together in seven weeks with rehearsals only on Saturday mornings,” said Miss Chris, the YWCA’s Director of Performing Arts and the show’s choreographer. The musical was directed by Katie Desjardins of The Goodspeed Opera House. Katie is a former student of the YWCA School of Dance and is currently the Drama Coach and Director for musicals at McGee Middle School in Berlin. Congratulations to all our actors and actresses on a phenomenal performance! We look forward to continuing the Youth Theater component of our Performing Arts program.